Your Putting Target should be your main focus. The ball is largely incidental. In Putting you don’t get to look at your target when performing. However, it is essential to have a vivid picture of your target in your mind's eye. I recently returned from a Golf Tournament where I was marshalling inside the ropes. As my web site is all about putting I was particularly interested in how the pros go about their business on the greens. I was looking to see where they directed their attention and how long they fixated on their target. I was a little disappointed with what I saw. A number of players are still wasting time with practice strokes while looking down at the ball. This time could be far better spent on focusing their attention on their target, and even dispensing with their practice strokes. The result of this imbalance in their pre-putt routine typically showed up in the number of putts where they miscalculated the direction or the distance. Everything that I have read in sport neuroscience reinforces the importance of mental imagery in performing a physical activity. Forming a clear picture of your putting target and how your ball will travel along a track or path to the hole is vital to attaining success on the greens. When your focus is more on the ball, or your stroke, your brain is not getting the information it needs. A series of short glances towards your target is never enough to form a good picture. You need to stare down your target. Tom Ward, PGA Tour Instructor, states that since your head is not in position for the physical eye to see the target, you must train the mind's eye to see it. Keeping your eyes fixated on the ball is like looking at a hypnotist's swinging pocket watch. In 2008 Eric Alpenfels wrote a book titled Instinct Putting. His main premise was that we would putt better if we executed the putt while looking at the target rather than the ball. This is how you shoot hoops, throw darts, and play pool. 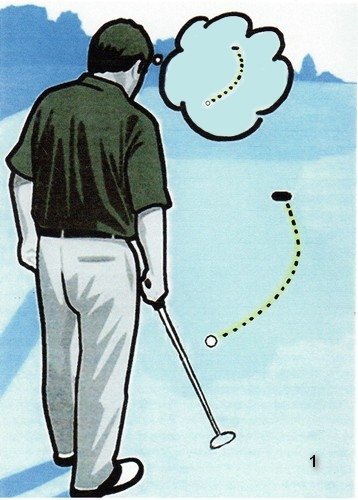 If is often recommended as a technique for golfers with the yips. For those of you who watch golf, the pre-putt routine of a player like Bo Van Pelt is a good example of paying attention to your target. He takes his rehearsal stroke(s) from behind the ball while facing his target. He then steps in, places his putter behind the ball, takes a deliberate look at his target, tracks back to the ball and putts without delay. Putting is all about holing putts rather than trying to make a perfect stroke. The more time you spend over the ball, the more time there is for extraneous thoughts and tension to creep into your putting stroke. More importantly the longer you take, the more the image of your target will fade from your mind. Remember - You are essentially putting to a picture that you can see in your head and the sharper your focus, the greater your chance of success. To quote from How to make Every Putt by Dr Joseph Parent.
" Look at the putt for at least three seconds, imprinting the whole picture in your memory. When you look down toward the ball, take a moment to recollect that picture, to see it as clearly as you can in your mind's eye. Once you have that picture in mind, you're ready to stroke the putt." 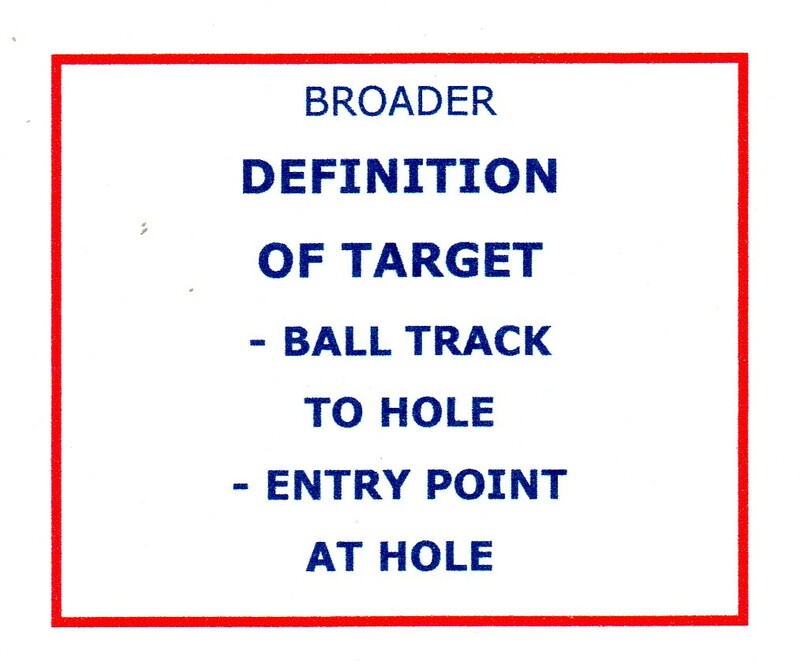 In summary, successful putting results from a greater focus on your target than the ball.